The Weavers are a large family of Old World tropical birds, many of them in open country habitats. The White-headed Buffalo-Weaver (left), for example, characterizes the thorn scrub forest of northern Kenya (its range also extends south into the savannas). The most famous attribute of the Weavers are the incredible nests many species weave. Some are fairly simple, like that of the thornscrub specialist with the great name -- Donaldson-Smith's Sparrow Weaver (below right) -- but others have elaborate entrance tunnels. Many weavers nest in huge colonies; densely-packed nests of the Village Weaver Ploceus cucullatus (below; the dark spots at the tips of the palm fronds) are a common sight in many small African towns. Weaver nests are so characteristic that they occupy several pages of plates in Zimmerman et al. 's (1996) new field guide to east Africa. One of the largest weaver nests belongs to the Príncipe Golden Weaver which hangs a large untidy globe halfway up a large tree (below left). The bird itself is quite a large weaver (below) and is entirely endemic to the small island of Príncipe in the Gulf of Guinea. A number of weavers are very local or have specialized habits. The Golden Palm Weaver of Kenya/Tanzania coast (below left) is bright and pretty and was a common visitor to the dining room at Samburu Lodge, northern Kenya. It reached that atypical habitat by following the large rivers (and their reed-beds) upstream into the heart of the African plain, and it is not found inland far away from the Tana and Uaso Nyiro rivers. The Seychelles Fody (below right) is a threatened species endemic to the Seychelles in the Indian Ocean. Drab in plumage, it may be threatened in competition with the bright Red Fodies Foudia madagascariensis which were introduced to the Seychelles. When I first visited Africa in 1981, the field guides only dealt with male weavers in breeding plumage. This left a host of birds unidentified, although I did have the good fortune to run into Terry Stevenson at the Lake Baringo Lodge where he identified this basic-plumaged Vitelline Masked-Weaver (left) for Steve Wilson and me. Now -- like many other identification problems in the world (Empidonax flycatchers, stints, gulls, Pterodroma petrels) -- much has been learned in sorting out the difficult plumage. The new Zimmerman (1996) field guide and others now present much useful identification information. I tend to think of weavers as an African family, but there are few weavers that occur in India, and fewer still that range as far east as Sumatra and Java. But within Africa there remain weavers about which almost nothing is known. One of those is the Black-chinned Weaver which is patchily distributed in stunted thornscrub in the savannas of northern Angola, southwestern Congo, and extreme southeasternmost Gabon. I'm not sure a photo of this species has ever been published, so I include my distant shot here (below left). There are also weavers that creep along giant tree limbs in the Congo Basin, and a variety of Malimbes that join mixed species flocks there. The Forest Weaver Ploceus bicolor of African equatorial and coastal woodlands has a wonderful song recalling a calliope. Finally, I would be remiss in failing to mention the lovely Bishops and Widowbirds with their primary colors and the dramatic tails worn by breeding-plumaged males. 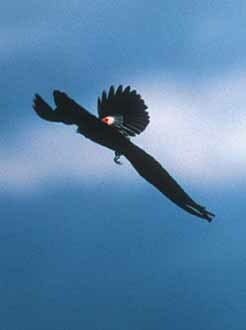 One of these is the Long-tailed Widowbird of east Africa (below right), here in a courtship flight. Photos: The White-headed Buffalo-WeaverDinemellia dinemelli was photographed in Samburu Nat'l Park, Kenya, in Nov 1981, and the Donaldson-Smith's Sparrow-Weaver Plocepasser donaldsoni was at its nest in adjacent Buffalo Springs Nat'l Park that same day. The palm-full of Village Weaver nests was in the hamlet of Bokaboka, Gabon, in July 1996. The Príncipe Golden Weaver Ploceus princeps and nest was next to the small town of Santo António on Príncipe Island, Såo Tomé e Príncipe, in July 1996. The Golden Palm Weaver P. bojeri was at Samburu Lodge, Kenya, in Nov 1981. The Seychelles Fody Foudia sechellarum was on Fregate I., Seychelles, in Nov 1992. The Vitelline Masked-Weaver P. vitellinus was a Lake Baringo, Kenya, in Nov 1981. 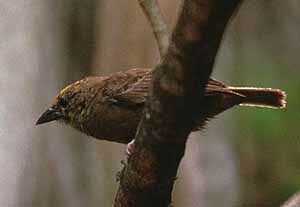 The Black-chinned Weaver P. nigrimentum was on the Batéké Plateau, Gabon, in July 1996. And the Long-tailed Widowbird Euplectes progne was photographed by Steve Wilson while I was changing film near Naro Maro, north of Mt. Kenya, Kenya, in Nov 1991 (he only sat on the fence for me....). Except as otherwise indicated, all photos © D. Roberson. There is no family book, or, if there is, I have not seen it. Even the Birds of Africa series has not reached the Ploceidae yet. One must essentially rely on field guides to learn about these birds.